Having only 2 days in Portland makes it challenging to cram all of our activities and eating into a short period of time. Since the weather was cooperating, we decided to hit the zoo on our last day. Unfortunately, that meant we would miss out on checking out some food carts. Ah, when there is a will, there is a way... Seeing how some open at 10:00am, I suggested we head Downtown for some "breakfast". Breaking from my usual MO, I decided to re-visit one of my favorite food stalls instead of going for something new. 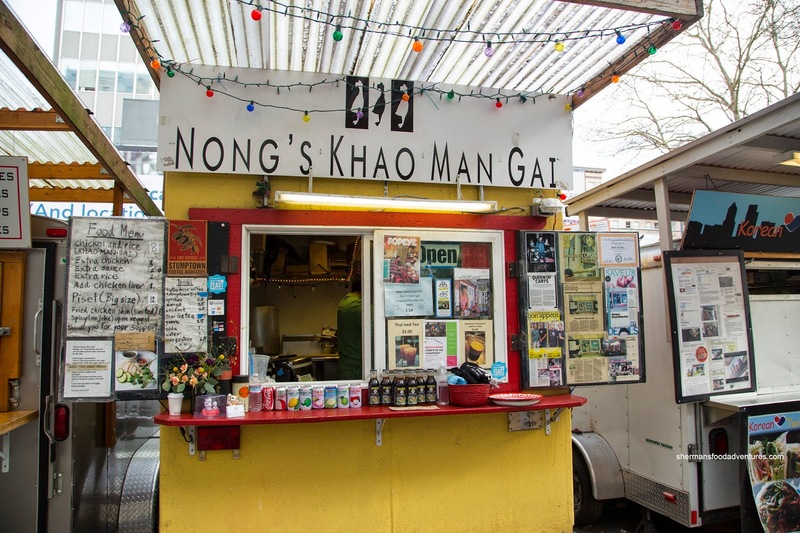 Yup, that stall happened to be Nong's Khao Man Gai and their famous poached chicken on rice which included a Wintermelon Soup. As a throw-in, I wasn't expecting much and really, it was just that. 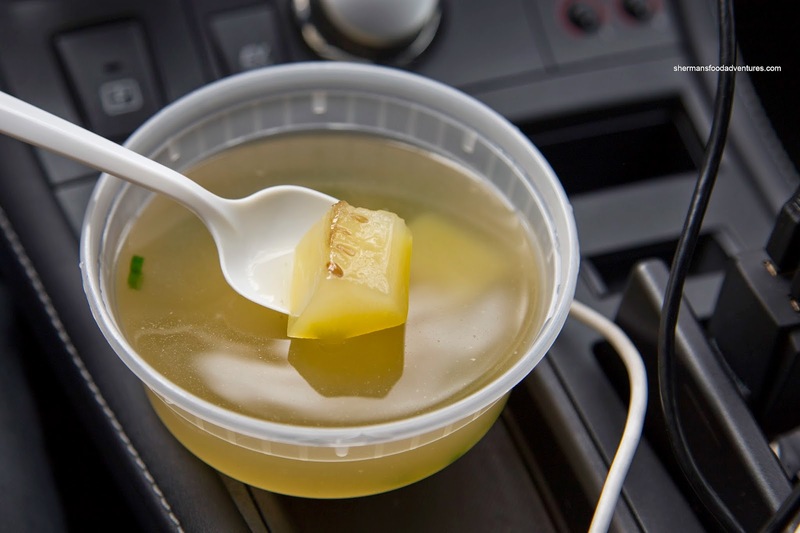 The broth was rather salty with gingery notes and a couple pieces of soft melon. 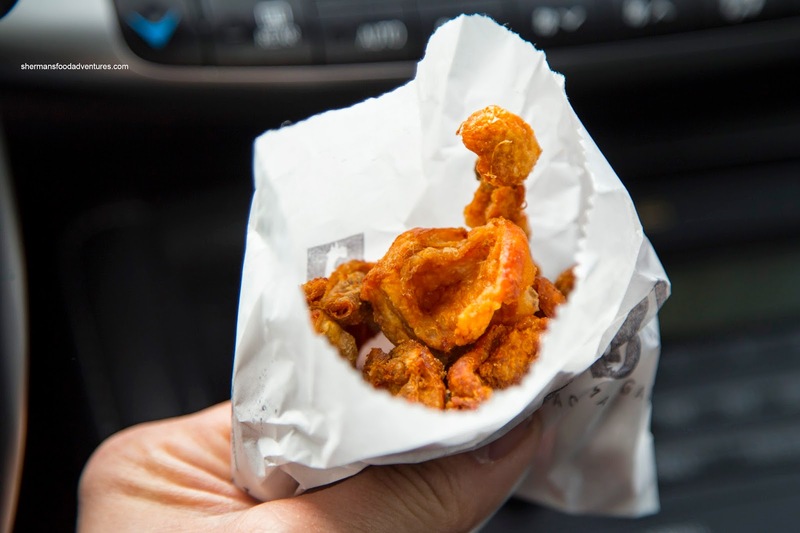 I also picked up a side of Fried Chicken Skin, not for myself, rather for my son as he loves all types of crunchy cracklings. This one was no exception being crunchy and almost airy. It was served with a side of their awesome ginger sauce. I only used it sparingly because I saved it for the rice. 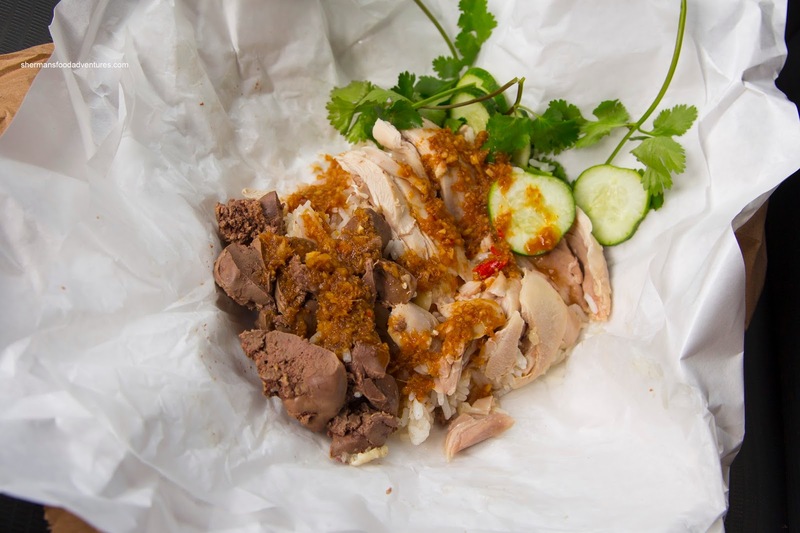 Now for the main event, the Khao Man Gai or a Thai version of Hainanese Chicken. I got a side of livers to make it more interesting. As much as the rice is fragrant from the chicken broth and oil while the dark meat (my choice) was moist, the one thing that brings it all together is the addictive sweet and tangy ginger sauce. I added the side of hot chili peppers as well which meant the whole thing was a veritable flavor explosion. Unlike many ginger-based condiments where the sharpness of the ginger can overwhelm, the sauce here is balanced with the right amount of sugar and equal parts of soy. When you cannot stop eating something, you know that it is darn good. That is why I returned even though I have blogged about it previously.